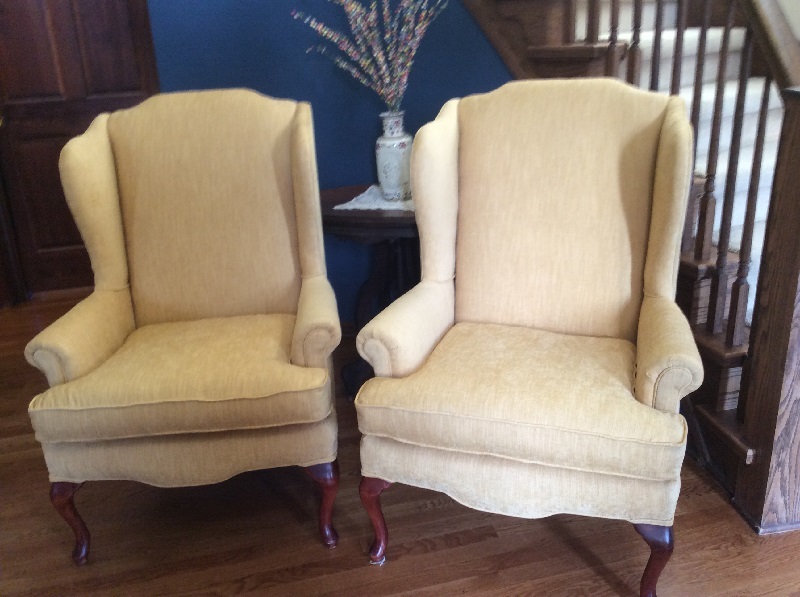 Reupholstered Wingback Chairs - Sew What? Sew Anything! - Sew What? Sew Anything! Best supporting actors in a living room – and the winners are this lovely pair of classic reupholstered wingback chairs in an understated, yet elegant, fabric choice! We have done several re-upholstery projects featuring chairs similar to these and just love how the choice of fabric guides the role the chairs will play on their home décor design stage. Before you start chasing all over town to find the right fabric, plan on scheduling a visit to the Sew What Sew Anything workroom where we have a mountain of books and fabric selections and the experience to help guide your selection choice for the best long-term result.